This image from NASA's Solar Dynamics Observatory shows the sun as it appeared in extreme ultraviolet wavelengths on March 5, 2012 just after a major solar flare. The intense solar storm that spilled huge amounts of radiation into space this week poses no risk to the six astronauts on the International Space Station, NASA officials say. The sun erupted in two powerful solar flares Tuesday (March 6), blasting a wave of solar plasma and energetic particles out into space. This radiation has proven dangerous to satellites — for example, some equipment on the European Space Agency's Venus Express spacecraft was blinded by the blast — and could even disrupt power grids on Earth. But the International Space Station and its crew aren't in a position to feel the sun's wrath this time, NASA officials said. "No danger; no sheltering required," NASA spokesman Rob Navias told SPACE.com. In the past, astronauts have occasionally had to hide out in protected areas of spacecraft parked at the space station to take shelter from radiation released by solar storms. But this time, space station commander Dan Burbank of NASA and his cremates, NASA astronaut Don Pettit, Russian cosmonauts Anton Shkaplerov, Anatoly Ivanishin and Oleg Kononenko, and European Space Agency astronaut André Kuipers, should be safe. 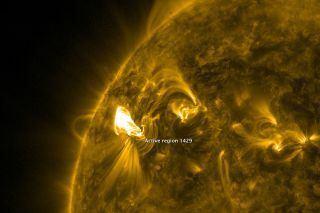 "Solar flares no concern for #ISS or its crew," NASA wrote in a Twitter update today (March 8). "Doctors at Mission Control in Houston always monitor radiation levels, which are acceptable." The sun's latest solar storm is one of the most powerful in the last five years, but similar occurrences are likely to get more common as the sun gears up for a period of solar maximum in 2013. Solar storms, which are caused by intense magnetic activity on our nearest star, tend to rise and fall in frequency over an 11-year cycle.